The University of Illinois at Urbana-Champaign department of entomology hosted its 35th annual Insect Fear Film Festival Feb. 24. The festival, founded in 1984 by entomology professor May Berenbaum, includes showings of feature-length films, shorts and TV episodes that illustrate various aspects of insect biology. Ticks were the theme of this year’s event. 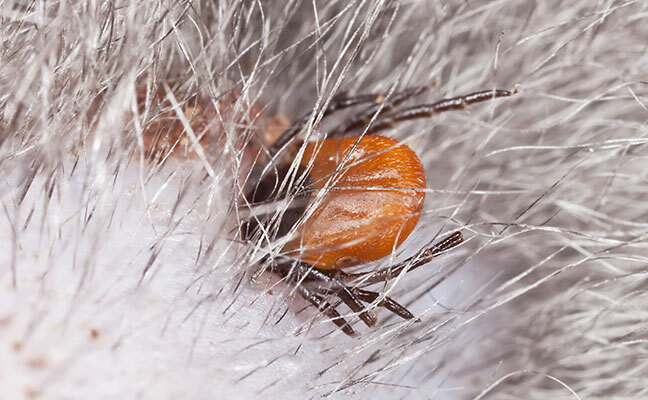 “These 8-legged arthropods are convenient film antagonists that inspire fear and loathing because they feed on human blood and spread diseases, including Lyme disease,” the university says in a press release. Also at the event was a live insect petting zoo, as well as exotic insect displays from around the world. The university also offered face-painting, balloon-insects and a raffle with arthropod-themed prizes. The films shown at the festival include “The Big Tick” (2006); an episode of the animated TV series “Ben 10” about an enormous tick-like alien bent on destroying Earth; “Bite of the Ruby Red” (1955); an episode of the TV series “Soldiers of Fortune,” featuring a scientist’s search for a cure for a deadly tick-borne fever in Central America; and the feature film, “Ticks” (1993), which follows a group of teenagers on a wilderness retreat that encounter super-sized ticks mutated by agricultural runoff from an illegal marijuana-growing operation.